Today we are happy to present a guest post from Jim Bridges, CEO of PayRight Health Solutions, LLC. Jim is a career health care executive with a focus on developing and growing health care markets and services. He has spent over 20 years working in the insurance industry. Jim is the CEO of PayRight Health Solutions, LLC, a technology company focused on improving payment education and management for home care and health care providers. 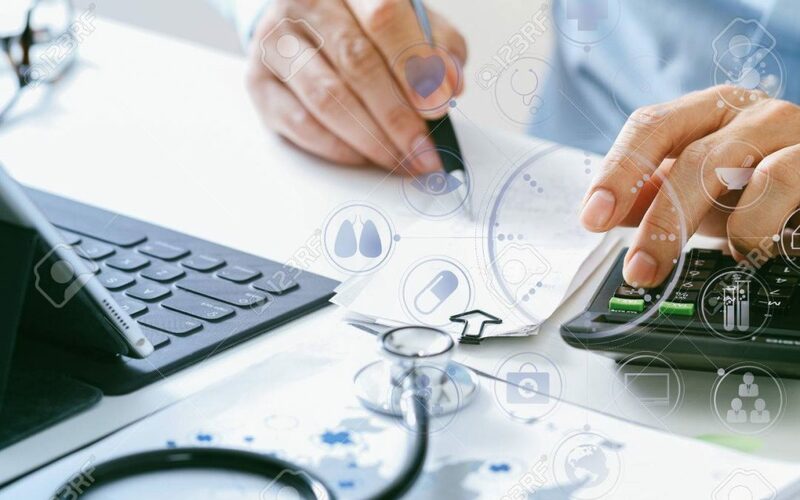 PayRight partners with leading agency management software systems to provide integrated billing and payment tools for both private duty and patient balance billing. PayRight also helps agencies with LTCi, VA, and other third-party billing, and can assist agencies in providing working capital to expand their third-party business. You have worked hard to establish your home care agency. Every day you recruit and train caregivers, provide quality care to your customers, and grow your business. If you are like most agencies, clients pay for care either directly or with help from their family. There is a growing new source of revenue for your agency and it covers over 7.2 million people who either use care now or will very soon1. That payment method is long-term care insurance (LTCi). Understanding the LTCi market and its products could improve the health of your agency by diversifying your revenue mix, accessing new payer sources, and providing a valuable service to prospective clients. Long-term care insurance, originally referred to as nursing home insurance, has been sold in the United States for over 30 years. In the early 1980s, LTCi expenditures in the US were less than $20 billion. By 2016, LTCi expenditures had risen to over $225 billion and the number of in-force policies was 7.2 million1. This is meaningful spending, but only accounts for roughly 250,000 policyholders. 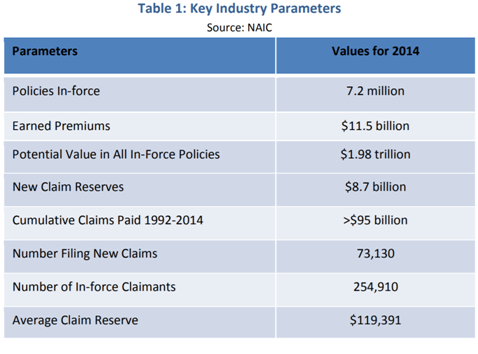 Based on these statistics from the NAIC, only 3.5% of policies in-force paid out any benefits last year. The buyers of LTCi policies are generally more affluent than average with over 60% of the buyers having incomes of more than $75,000 per year and over 80% of these with at least $100,000 in assets5. The insurance industry, like any business, has its own language and terminology. In simpler terms, the above chart demonstrates that this year, the total number of insurers are putting aside over $8.7 billion to pay new LTCi claims in the next year alone (New Claim Reserves), with potential payouts in the future of up to almost $2 trillion (Potential Value in All In-Force Policies). About 71% of LTCi payouts in 2016 were for institutional claims, which still leaves $2.5 billion in potential payment for home care2. On an individual basis, this equals $34,000 reserved for home care per claimant (Average Claim Reserve). For the average home care agency with revenue of $1.6 million3, each LTCi client could represent a 2.25% increase in revenue. Given the size of the LTCi market, as well as the significant growth in the future, accessing and servicing this market can provide opportunity for further growth. LTCi carriers take between 35 and 60 days to pay their claims. About 15% of these payments have an error, often due to incorrect billing or an error in calculating the benefits. In these cases, the agency either has to balance bill the customer or rebill the agency. Nearly all policies include either coinsurance, elimination periods, daily max limits, or other coverage limits and cost-sharing. This can often make it very confusing for the client as to what coverage they will receive and will affect the reimbursement that you get directly from the carrier. There is a lack of standardization in benefit design and structure. There is also not a catalog of standard terms or definitions for LTCi policies. This can make it hard for a consumer, who generally access these benefits only once and later in life, to understand the specifics of what they have purchased. LTCi insurers are indemnity insurance companies. They insure all kinds of things including life insurance, accident, umbrella, and other kinds of insurance in addition to LTCi. In Q1 2017, Genworth, one of the largest LTCi carriers reported a quarterly income from LTCi of $14 million. However, total income for the quarter was $143 million – so even for one of the largest carriers long term care insurance represented only 10% of their profits6. In addition, many carriers outsource the administration and payment of LTCi policies to a third party, since the structure is different than the rest of their insurance and requires a lot more processing effort. What does this mean to your agency? Despite the opportunity that LTCi coverage presents, you need to be prepared for the challenges it brings. The good news is there are a number of steps you can take to be prepared that will allow you to market to and serve LTCi clients with confidence. Most LTCi policies are individually based and not as highly regulated as other insurance consumers are used to, such as life, auto, and health. As a result, there is a wide amount of variance in policy benefits both among carriers and even within individual carriers. Make sure that your staff understands the specifics of each client’s policy benefits, as well as their usage of benefits to date. Many agencies count on the client or their family to deal with the carriers directly, but if there is an issue, it may result in delays in payment to your agency. Unlike health insurance, which has standard billing forms, each LTCi carrier has variations in how they will accept bills and supporting documentation. You can help your clients significantly, if you know how to provide the appropriate documentation for each carrier. If your agency is prepared to help your customers navigate their policy, the benefits, and the reimbursement, this will put them more at ease working with your agency and may make the difference in you getting their business. One challenge an agency may have is that it can take of 75 days to receive payment from LTCi carriers, you may end up paying $1,400-$2,000 in caregiver expenses prior to being reimbursed. Being able to carefully manage your cash flow, and take on these clients quickly, can improve the odds LTCi clients will select your agency for their service. The average duration of service for clients is 12-18 months, so the lifetime value of taking these clients is in your favor. Once you have developed competencies around navigating carriers, benefits, billing, and cash flow from third parties, you should leverage those messages to your referral partners. Your agency can become a care provider of choice for those with third party LTCi coverage. If your agency can develop these LTCi management skills, it can achieve outsized client growth and satisfaction over the next decade. 5 Who buys long-term care insurance, January 2017, Lifeplans, Inc.
Kevin has worked at Shoshana Technologies for 6 years, and in that time he's worn many hats. He currently works in the marketing department, where he focuses on generating content to help home care agencies solve some of their most common day to day challenges.